Model Rectifier Corporation (MRC) was founded in 1947, and its traditional product line was based around electrical components for model railroads and slot cars. Given that the DCC is the fastest growing segment of the model railway hobby, it makes business sense for MRC to join in on the action, and the company has produced a worthy line up of products, with “bells and whistles” that probably have the DCC market leaders (Lenz and Digitrax) a little worried! As can be expected, MRC provides a range of DCC products, from starter DCC sets, wireless devices, decoders, sound modules, all the way up to a DCC system that is suitable for G-Scale trains. The Explorer is an entry level, “starter” system geared towards getting newcomers up an running as easily as possible. 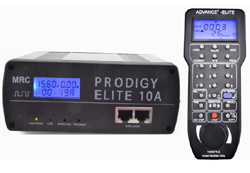 The Prodigy Elite, provides 10 amps of controlled power for DCC operation, it handles the high power demands of G gauge, while being able to safely run HO, N and other gauges. Ideal for large clubs. The Prodigy Advance Wireless does everything Prodigy Advance 2 can do. It enables you to program, acquire and run your locos from a wireless handheld. Unlike others, there’s no need to incessantly plug in and unplug every time you want to program a loco! A few issues are known that makes MRC systems less ideal than say Lens or Digitrax for layout Automation. 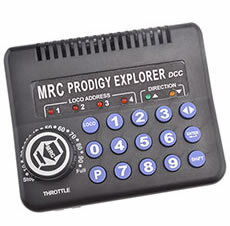 At this time there is no software package that can interface with the MRC Prodigy DCC system, except MRC own proprietary computer interface. The software is for Microsoft Windows only, and is the only software which works with their Prodigy Computer Interface.